These instructions assume that you would like to set up “catch-all” forwarding, that is you would like mail sent to any e-mail address in your domain to go to some real e-mail address that is outside the domain and most likely managed by a third-party web-based e-mail provider such as Gmail, Yahoo! or Hotmail. To achieve this we need to set up two forwards per domain. 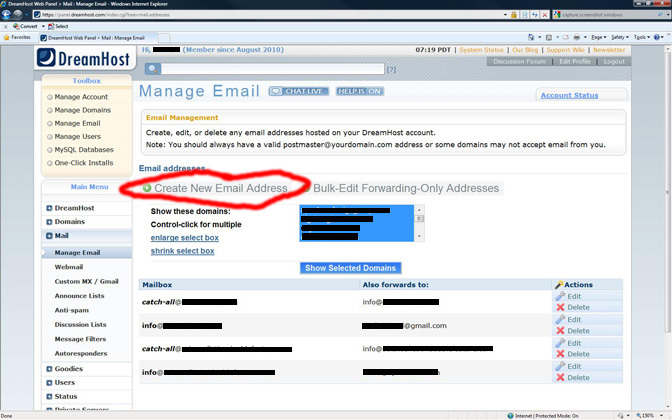 The first sets up a single e-mail address within the domain to forward to your real e-mail address and the second sets up a “catch-all” e-mail address to forward mail to every other address to the single e-mail address within the domain. Note that this scheme was developed to work around the fact that Dreamhost will not allow direct forwarding from a catch-all e-mail address to another e-mail address that is not hosted by Dreamhost. Log in to your Dreamhost account control panel. From the navigation panel click on the big Email button [screenshot]. Click on Create New Email Address link [screenshot]. Scroll down until the Forward-Only Email section is visible [screenshot]. 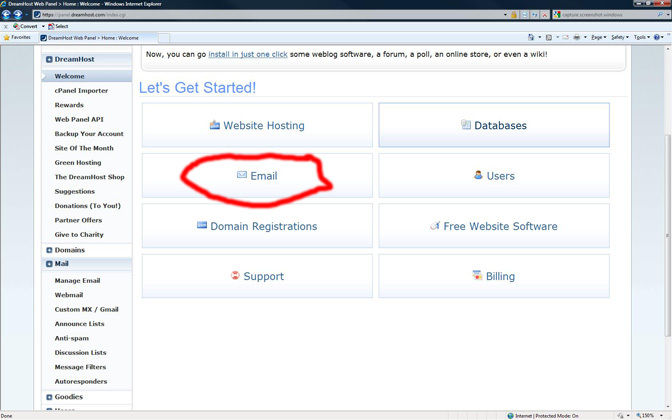 Enter an e-mail address field by selecting the domain name and entering a value in the Email Address field, e.g. info. [screenshot]. 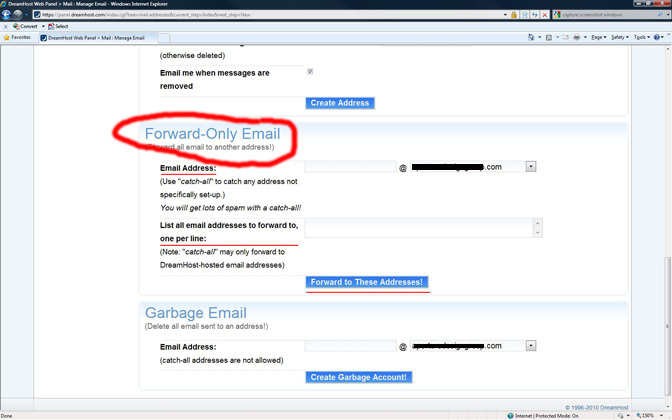 In the List all email addresses to forward to, one per line field enter your real e-mail address, e.g. me@gmail.com etc. Click the Forward to These Addresses! button to create the forwarding. Enter catch-all in the Email Address field. [screenshot]. In the List all email addresses to forward to, one per line field enter the info@yourdomain.com address created previously. It will take some time for the changes to take effect, but once the changes are in place all e-mail sent to any address in your domain will forward to the e-mail address me@gmail.com.